Gypsy gold does not chink and glitter. It gleams in the sun and neighs in the dark. I read this quote from the Galaway Gypsys, and it made me smile – there is a sentiment that truly describes how we feel about horses. 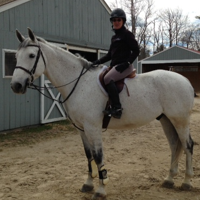 Our horses are dearer than any gold we can wear on our fingers! That being said, there’s a lot to be said about gold horse rings. The jewelry term ‘Gypsy Set’ is not one everyone is familiar with. What the term means is a ring, usually gold, that has one or more jewels set deeply into the metal. This style of setting stones is ideal for Rider Rings – rings worn by horsewomen that can stand up to the demands of life with horses. The risk of losing a stone is diminished when the stones are securely held in the channel. You’ll see Gypsy set horse jewelry a lot when you’re considering vintage and estate horse jewelry. People were far more cautious with their gems back in the day – but no one really wants to lose a sapphire or diamond now. 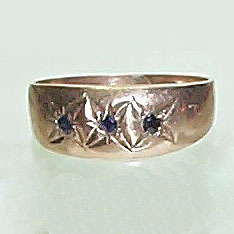 If you choose this Vintage 9K Rose Gold and Sapphire Ring you’ll be able to wear it with confidence. Rose gold is one of the hottest jewelry trends for the 2011 Spring Season. Did you know that there’s an American Gypsy Horse breed? Talk about some truly magnificent animals. These horses are quite large, and strikingly colored: I can imagine how a team would look pulling a colorful wagon into town!